September 30, 2013 - On Sunday a Cessna Citation 525A (N194SJ) business jet crashed at 6:24 PM just after touchdown at Santa Monica Municipal Airport, California killing all onboard. The twin engine Citation had departed from Friedman Memorial Airport Hailey, Idaho at 6:20 PM with an unknown number of passengers. Upon touchdown on runway 21 at Santa Monica it appears the aircraft may have blown one of its tires which resulted in the aircraft running off the right side of the runway, crashing inside of a hanger and then bursting into flames. 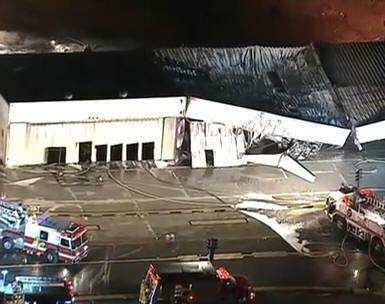 The heat from the fire was so intense the roof of the hanger collapsed onto the jet making it impossible to gain access to the jet and for anyone onboard the jet or in the hanger to have survived. Captain John Nevandro of the Santa Monica Fire Department said “It was an un-survivable crash”. The aircraft is owned by CREX-MML LLC of Malibu, California, CREX-MML LLC is owned by Mark Benjamin. It is believed that the aircraft was piloted by Mark Benjamin who is a private pilot with a type rating in the Cessna Citation 525A. Charles Muttillo, vice president of Morley Builders of Santa Monica, issued a statement today in which he stated "We are aware of a plane crash at Santa Monica Airport last night. While we do not have specific facts, we believe that our President and CEO, Mark Benjamin, and his son, Luke Benjamin, a Senior Project Engineer with us were on board’.